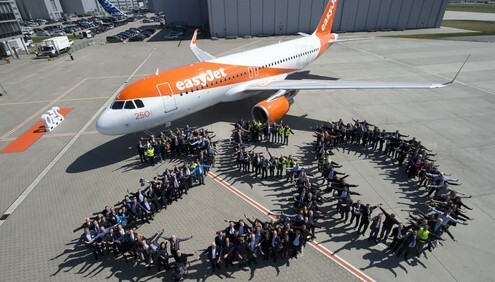 LONDON, 2015-4-23 — /Travel PR News/ — easyJet and Airbus have celebrated their successful partnership at a ceremony in Hamburg to mark the delivery the airline’s 250th Airbus A320 family aircraft. Carolyn McCall, easyJet CEO, Jean-Paul Ebanga, CFM International President and CEO, Didier Evrard, Airbus EVP and Head of Programmes, and Christopher Buckley, Airbus EVP Europe, Africa and Asia-Pacific were present at the event. easyJet is Europe’s leading airline offering a unique and winning combination of the best route network connecting Europe’s primary airports, with great value fares and friendly service . easyJet aims to be a good corporate citizen, employing people on local contracts in seven countries across Europe in full compliance with national laws and recognising their trade unions. The airline supports a number of local charities and also has a corporate partnership with UNICEF which has raised over £4m for the most vulnerable children since it was established in 2012. This entry was posted in Airlines, Airports, Business, Flights, Transportation, Travel, Travel Management, Travel Services, Travelers and tagged Airbus, Airbus A320 family aircraft, Carolyn McCall, Didier Evrard, easyJet. Bookmark the permalink.